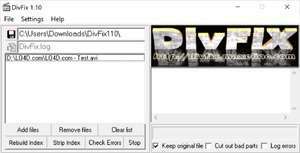 DiVFix is a completely free tool that offers the ability to repair (and watch) DivX files which have only been downloaded partially. It finds and attempts to repair errors encountered in the AVI files it analyzes. The program is both lightweight and portable, making installation unnecessary. You can run it from external devices such as USB sticks or external hard drives if you wish. Version 1.10 is a freeware program which does not have restrictions and it's free so it doesn't cost anything. For security reasons, you should also check out the DivFix download at LO4D.com which includes virus and malware tests. Additional screenshots of this application download may be available, too.